As the largest and longest-running, annual sumo competition worldwide, outside of Japan, the US Sumo Open has been the first domestic event to bring Pro Sumo Grand Champions as special guests, the first to pioneer women’s matches in American tournaments, the first to feature multiple World Sumo Champions in a single event, and the first to include former top-ranked Pro Sumo wrestlers in competition! The competition level is also spectacular, with over 500 international athletes who have wrestled. Most of these competitors are National or World Sumo Champions — from nearly 30 different countries. This is the only sumo event in North America where you can catch this caliber of international sumo, every single year! The 19th annual US Sumo Open was spectacular, as nearly 5,000 fans watched 64 international sumo wrestlers in 198 back-to-back matches! Ukraine dominated, winning most gold medals, with only one gold to Japan. Shocking upsets against guys with Pro Sumo pedigree rocked the arena! This event featured some really spectacular matches, an extremely fast pace, and like last year, a demonstration of skill overcoming size! This was the most dramatic competition yet! Former champions reclaimed glory, records were set, and a 245-pound athlete won the Openweight title! Byamba reclaimed glory, with a 13-0 record, winning both heavyweight and openweight divisions, undefeated. The competition level was spectacular, attracting many medallists from the World Sumo Championships, including Aron Rozum (Poland) and Batyr Altyev (Russia). Even Olympic wrestling gold medallist Karam Gaber, trying sumo for the first time, could not get past the quarter-finals in the middleweight division! Nearly 4,000 fans watched history being made, as Byamba’s 8-year streak of gold medals was ended at last by Egypt’s Ramy Elgazar and Roy Sims (USA). In fact, Roy Sims became the first American EVER to win a US Sumo Open gold medal in either men’s heavyweight or openweight! A total of 57 elite sumo wrestlers competed in 147 matches, for 5 hours, in front of 3,500 fans! Special guest former “Yamamotoyama” of Pro Sumo fame was serve as head judge. The 2014 US Sumo Open aired as a two-hour special on national TV, 10 times, on Universal Sports Network. Nearly 4,000 people showed up to watch, at a venue with 3,000 seats. The packed crowd saw Byamba continued his amazing winning streak, by capturing the gold medal for the 7th year in a row, completely unprecedented! Byamba’s unforgettable “Sumo Slam” (which even shook the internet!) brought sumo awareness worldwide to a new level. 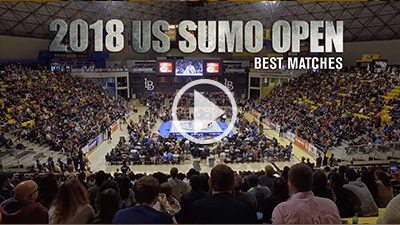 The US Sumo Open returned to historic Little Tokyo, where multi-time heavyweight & openweight past medalists Byambajav Ulambayar, Bayanbat Davaadalai, Kelly Gneiting, and Siosifa Isamau all medaled again in 2012, in some exciting re-matches from years past. A strong field of athletes from nine countries competed in the US Sumo Open’s Las Vegas debut. Not surprisingly, the male and female World Champions both swept their heavyweight and openweight divisions, as Byamba (men’s champion) went 9-0, and Sylwia (women’s champion) went 6-0. Mongolians won most of the men’s medals, even as other foreigners (from Tonga and Canada) came close, as the event took place for the first time in Orange County, in front of an over-capacity crowd. Byamba continued his gold medal winning streak, for the 4th year in a row! Coupled with the US Sumo Open competition, fans got a chance to meet with, eat with, and take photos with the sumo wrestlers at the conclusion of the matches. This “Sumo Bash” was truly a new sumo experience for many hard-core fans, and as expected, Mongolians led the way. Byambajav Ulambayar defeated giant Petar Stoyanov for the third consecutive time in the US Sumo Open (in the men’s heavyweight), but Petar then upset Byamba in the last match of the day — the Openweight Finals — to win his own gold medal! Other Mongolians were remarkable, too. Mongolian athletes captured every single men’s gold medal, and the only Mongolian female athlete won each class that she competed in. Foreign athletes controlled nearly every weight class. Of 12 men’s medals, 11 were captured by Europeans and Asians, with only one medal going to an American. The competition level at the 6th annual was higher than at all past events, with 47 of the world’s top sumo wrestlers competing for prestige, prizes, and cash. As in years past, international teams dominated, as the 18 foreign athletes won most of the medals (13 out of 23). In fact, foreign athletes won gold medals in all 7 divisions they competed in! Teams from around the world, headlined by a powerful Japanese team, met in the ring, held on an elevated stage (a first for international tournaments in this country). World Champion Kato was dominant, with other Japanese and foreign wrestlers taking most medals, in front of a packed crowd. The 4th annual was filled with action and drama, as some of the world’s greatest amateur sumo athletes competed. Fierce rivalries among international competitors were highlighted in several semi-final and final matches. One of sumo’s greatest Yokozuna (Grand Champions) ever, MUSASHIMARU, attended from Japan, and was joined by a fellow pro, who officiated. Retired Yokozuna (Grand Champion) AKEBONO attended as special guest. Among the 31 international sumo athletes, many of the 2002 champions met again in the final rounds, with foreign teams dominating again. AKEBONO demonstrated sumo, taught international teams, commentated, and even joined in some matches at the end! This competition featured 50 international sumo champions from 13 countries, including several national and world champions! The competition was fierce, dominated by foreign teams. American athletes only did well in the men’s lightweight, while a group of well-trained European teams took most of the medals. Retired professional sumo champion KONISHIKI and two-time amateur World Sumo Champion Svetoslav Binev attended as special guests. From 9 nations, a total of 25 sumo competitors, including Japanese University Champions, battled in the ring, in this inaugural event.